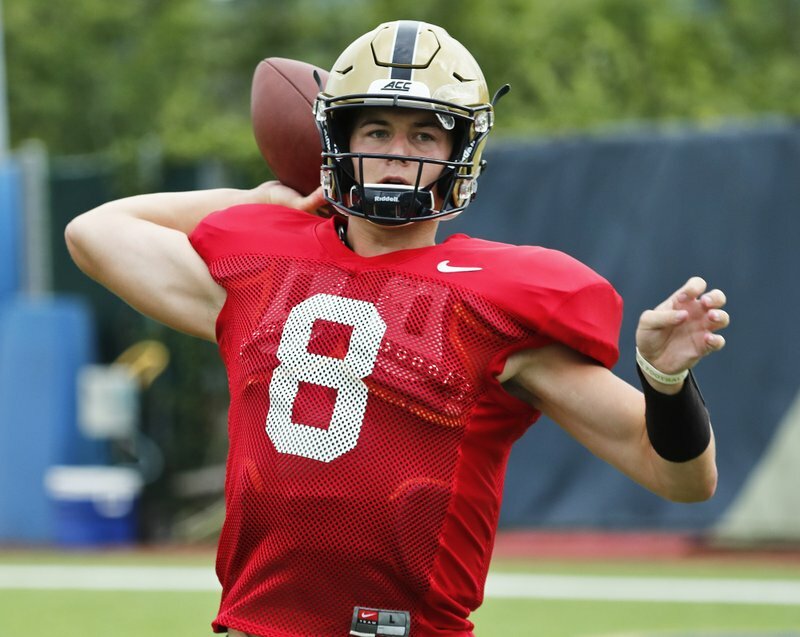 PITTSBURGH (AP) — Kenny Pickett’s first college start set almost impossible expectations for his second. Everywhere except inside the Pittsburgh locker room. While coach Pat Narduzzi understands the hype surrounding the sophomore quarterback — last seen engineering an upset of then second-ranked Miami in the 2017 regular season finale — Narduzzi also knows a reality check will come at some point. Perhaps as early as Saturday when the Panthers open against Albany. Even if Pickett didn’t play like one while accounting for all three Pitt touchdowns in the victory over the Hurricanes. Nine months later he steps onto Heinz Field again eager to prove it was no fluke. The atmosphere will be different. So will the stakes. That’s fine by Pickett. A year ago he was running the scout team. Now he’s firmly entrenched as the starter. Will he be pumped? Yes. Will he show it? Meh. The Panthers could use a steady hand at the wheel following a tumultuous 2017 in which they finished 5-7 and failed to reach a bowl game for the first time in a decade. A seemingly unending rotation at quarterback — from Max Browne to Ben DiNucci back to Browne back to DiNucci then ultimately to Pickett — didn’t help. Pickett’s rise could give Pitt long-term stability , though he is quick to point out he’s just one part of an offense he believes will be “explosive” under second-year coordinator Shawn Watson. Now the Panthers believe they do. Senior running backs Darrin Hall and Qadree Ollison are eager to bounce back after an underachieving 2017 . Fullback George Aston returns after missing most of last season due to injury. The receivers are largely inexperienced but Pickett is hardly concerned. Some things to look for as Pitt attempts not to get tripped up by the Great Danes. NO QB JITTERS: Albany QB Vince Testaverde Jr., a fifth-year graduate transfer at his third school, will start his first game for the Great Danes. The son of longtime NFL quarterback and 1986 Heisman Trophy winner Vinny Testaverde is a transfer from Miami, where his dad starred. He started his college career at Texas Tech and played in one game as a non-scholarship freshman in 2014, completing 15 of 26 passes for 116 yards against Texas, then transferred after one semester. Although his dad will be at the game, Vince says it will be business as usual. ATTITUDE ADJUSTMENT: Narduzzi raised some eyebrows when he told a crowd of fans at a kickoff luncheon that he would see them in Charlotte — site of the ACC title game —at the end of the season. It’s a limb Narduzzi is willing to step out on thanks to the mentality of his 19 seniors. OLD HOME WEEKEND: Albany head coach Greg Gattuso is a Pittsburgh native. He won eight MAAC championships in 12 seasons at Duquesne (1993-2004) and also worked on the Panthers’ staff for six seasons (2005- 11). This will be Albany’s second game ever against an FBS opponent. “They had an opening (on the schedule). It worked out. It was a much better idea four years ago than it is right now,” Gattuso said, joking. “But I’m excited about it, and I think the kids are really excited about it. Albany offensive line coach Jim Sweeney is from Pittsburgh and a Pitt grad. AP Sports Writer John Kekis in Syracuse, New York, contributed to this report.